Figure 1. 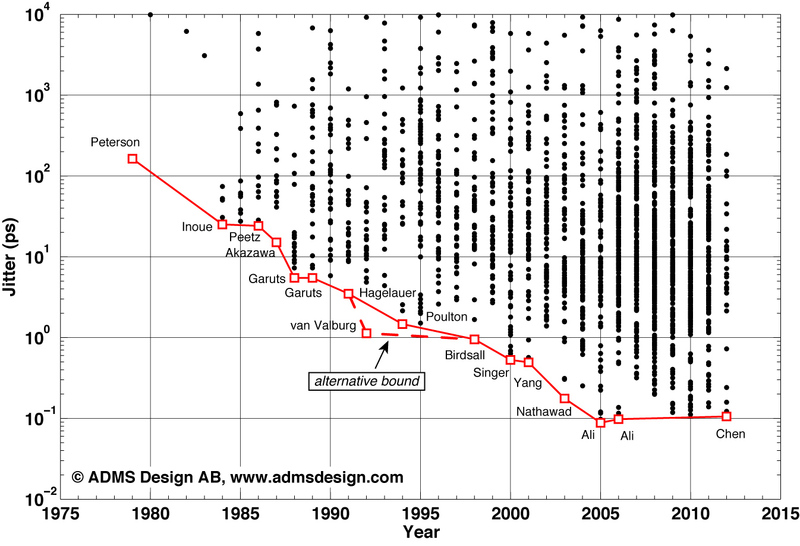 Evolution of relative noise-floor for DSM (o) and Nyquist (#) ADCs over time. WHAT YOU SEE IS WHAT YOU GET: We have previously studied the evolution of absolute thermal noise levels, and sampling jitter for analog-to-digital converters (ADC). Finally, the overall noise performance evolution is observed with all noise contributors included. Whereas the two previous posts analyzed two fundamental noise components in isolation, this post looks at the actual noise performance achieved with everything included. This is the ADC performance you actually get. The ADC survey data spans a very wide range of converter specifications. An SNR of x dB in 20 kHz bandwidth is not as impressive as achieving the same in a 1GHz band. Using the relative noise-floor nr in dB/Hz derived by (1) allow ADCs with widely different Nyquist bandwidths (BW) to be compared with respect to noise performance. Figure 1 shows the evolution of nr for delta-sigma modulators (DSM) and Nyquist ADCs over time. A similar plot, based on less data, and not differentiating between DSM and Nyquist ADCs is found in . From a linear fit of the state-of-the-art data points, it is seen here that ADC noise-floor for has evolved at an average rate of ~2.2 dB/year until year 2000 for DSM, after which it has remained in saturation. 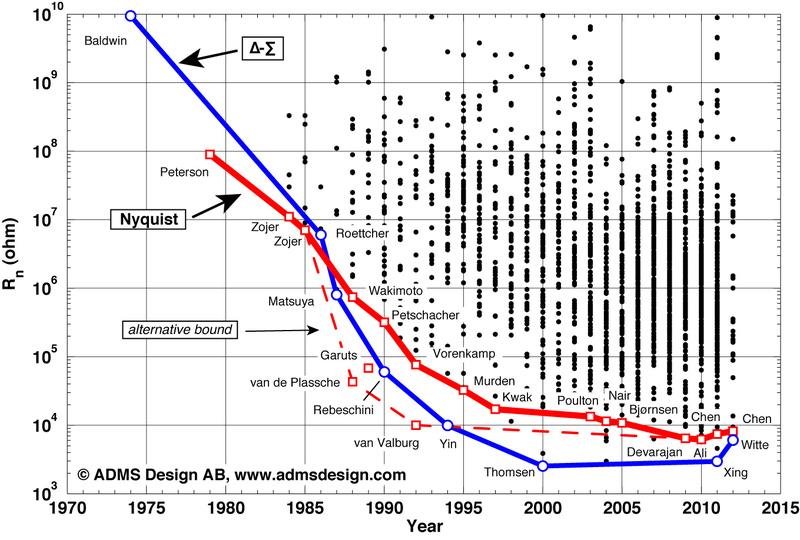 Nyquist ADCs have developed at a slower rate of ~1.3 dB/year until 2010. The current state-of-the-art is approximately the same for both: –162 dB/Hz for DSM , and –161 dB/Hz for Nyquist . Since the state-of-the-art for Nyquist converters was so recently reported, it cannot be concluded only from Fig. 1 that the noise floor for Nyquist ADCs is in saturation. 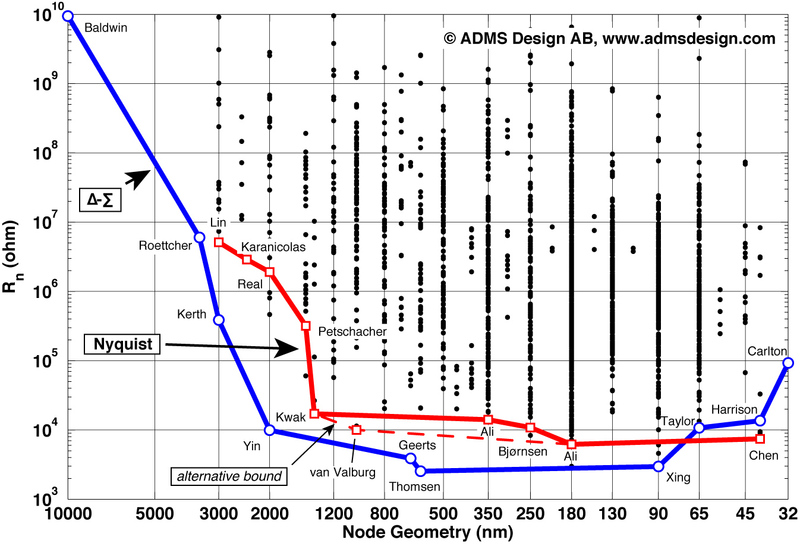 A likely explanation for the DSM trend is, however, the lower signal swing, and thus higher relative noise-floor, implied by the continuous scaling of semiconductor technology ,. This is also seen in Fig. 2. Although the absolute noise-floor may remain constant in devices , the relative noise-floor is raised when signal swing is reduced. New technologies may allow higher bandwidths, but the simultaneous combination of SNR and bandwidth has not improved for a decade due to this inherent dynamic-range limitation of nanometer technology . It is likely to assume that Nyquist converters will suffer from this limit at least as much as delta-sigma modulators do. Noise-performance normalized to signal bandwidth therefore seems to have reached the physical limits of process technology defined by the available signal swing. Expecting a further reduction in signal swing , future ADCs could very well fail to maintain the current state-of-the-art in noise performance. Figure 2. 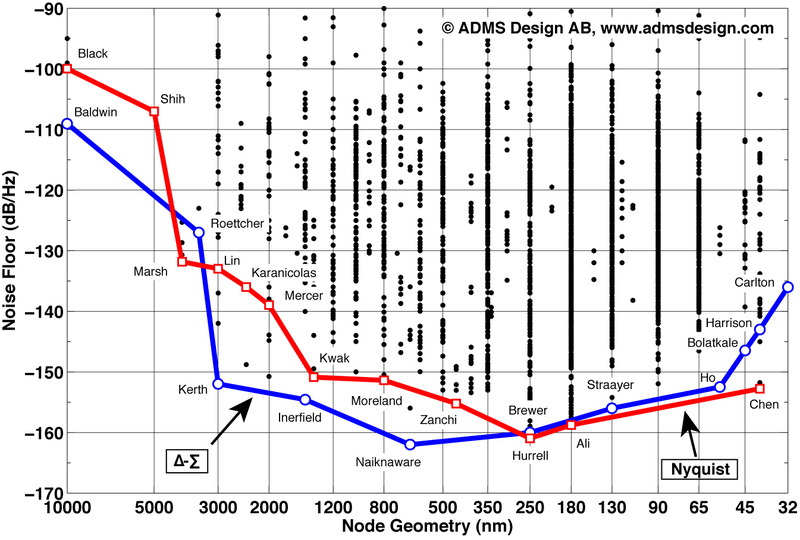 Evolution of relative noise-floor for DSM (o) and Nyquist (#) ADCs vs. node geometry (any technology). Over the last three posts, it was seen that the overall state-of-the-art with respect to absolute noise power, sampling jitter, and relative total noise floor has not improved during the last 5–10 years. It is therefore concluded that all significant aspects of ADC noise performance appear to have reached saturation. This is an expected, yet significant result of the study as it clearly confirms the commonly raised concerns regarding analog design and dynamic range in scaled technologies, e.g., in -. My conclusion is that A/D-converters have already hit the noise floor – at least its softer upper coating. In upcoming parts of the ADC performance evolution series of posts we will next take a look at ADC linearity trends. As commented in part 1, the trends of degradation observed below 65 nm in Fig. 2 may be due to lack of reported attempts, and not necessarily due to physics. Using a circuit design that allows for large input signal swing can help a lot in improving relative noise floor performance. As an example, the state-of-the-art design by Hurrell et al. reports an 8.2 V peak-to-peak input full-scale range. K. Bult, “Analog design in deep sub-micron CMOS,” Proc. of Eur. Solid-State Circ. Conf. (ESSCIRC), Stockholm, Sweden, pp. 126–132, Sept., 2000. Figure. 1. Evolution of SNR-vs.-fin envelope for Nyquist ADCs: Current state-of-the art is compared to state-of-the-art envelopes at 1980 (o), 1990 (#) and 2000 (<). Theoretical SNR limits for jitter are indicated. JITTER TRENDS: Previously we observed the evolution of absolute thermal noise levels in ADCs. In this second post in a series of three, we will look at sampling time uncertainty, commonly referred to as jitter. The future evolution of A/D-converter jitter performance will have great impact on the development of advanced communications infrastructure, or any other application where you wish to sample at radio frequencies (RF) or beyond. A thorough assessment of past and present jitter evolution trends is therefore a highly valuable reference for system-level strategists, as it gives an indication of what kind of ADC performance to expect in the future. Sampling a single-tone input with frequency fin and rms sampling time uncertainty σt in an otherwise ideal system yields a jitter-defined SNR in dBc defined by (1). An ADC where the circuit noise is dominated by sampling jitter has circuit signal-to-noise ratio SNRC ≈ SNRJ. See definition of SNRC in previous post. Observing the SNR achieved at a particular input frequency therefore leads to a worst-case estimate of sampling jitter, and looking at the SNRC vs. fin progress for the entire body of scientific Nyquist ADC data thus renders a conservative estimate of jitter performance evolution over time. Figure 1 shows the state-of-the-art envelopes for SNRC vs. fin at 1980, 1990, and 2000 compared to present day (~Q1 2012). By using SNRC instead of SNR, the ideal quantization noise component that would falsely add to the jitter estimate is removed. For data points where the effect of jitter has fully kicked in, this actually makes little difference. Since not all papers report performance at such high input frequencies, the use of SNRC instead of SNR still gives a better jitter estimation. An SNRJ vs. fin jitter raster according to (1) has been included as a visual guide in Fig. 1 for jitter values of 0.01, 0.1, 1, and 10 ps. The state-of-the-art in 1980 is defined by only a few designs and therefore difficult to interpret. By 1990, a much larger number of attempts have been made, and the high-frequency roll-off is almost perfectly aligned with the theoretical SNR limit for 8–10 ps jitter. Garuts et al. achieves 5.5 ps at 1 GHz input with a 4-b, 1 GS/s ADC (9.8 ps without quantization error subtraction) . During the following decade, the lowest jitter estimate was reduced by almost exactly ten times to the 0.53 ps reported by Singer et al. for an IF-sampling 12‑b, 65 MS/s ADC in . A slight slowdown is then observed for the last 11 years, when the jitter evolution front progress by less than a factor of ten across most of the frequency range. 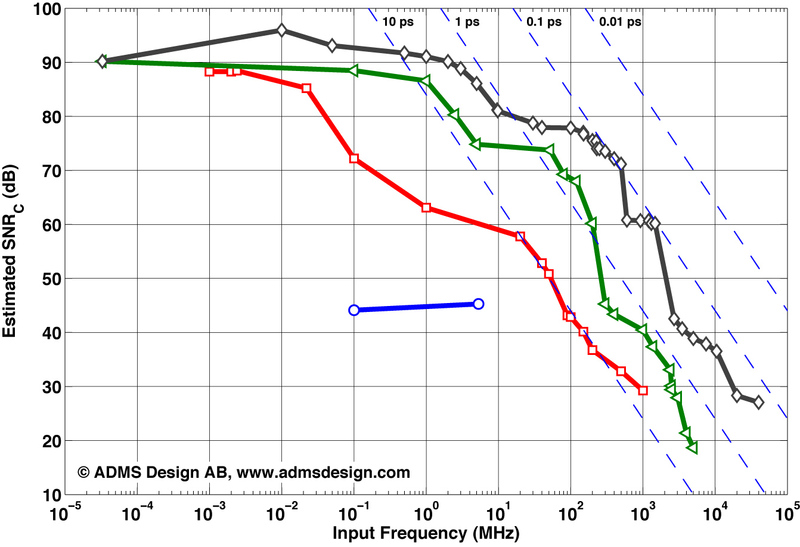 Current state-of-the-art is defined by the 14‑b, 125 MS/s, RF/IF-sampling ADC reported by Ali . The 88 fs rms jitter estimated at 500 MHz fin is a six times improvement over . Looking at Fig. 1, it is evident where the main effort was focused. Whereas the state-of-the-art boundary is almost straight at 1990, there is an obvious “bump” in the 50–200 MHz range by 2000, which has migrated to 100–500 MHz to this date, and a secondary bump has emerged recently at 1–2GHz, defined by data reported in . Although there are other applications matching these frequency ranges, the progress of the evolution front aligns very well with the evolution of requirements for wideband communications infrastructure. The current state-of-the art boundary is largely defined by publications stating wireless or digital communication as the target application. Hence it is concluded that communications applications have been a main driver for jitter performance over the last two decades. A point of concern for the communications industry could be that the current state-of-the-art  was achieved in 2005, using a 0.35 µm BiCMOS process. Observing the state-of-the-art estimate of σt (at any fin) over time, as shown in Fig. 2, jitter performance appears to be in a state of saturation. A closer inspection of the underlying data set gives further reason to assume saturation of jitter performance: Figure 3 shows the evolution of jitter performance vs. technology scaling. Although it’s possible that jitter eventually starts to improve in deeply scaled nodes, the current trend clearly supports the assumption of jitter performance saturation. In the third and, for this time, final post on noise performance evolution, we will study the evolution of A/D-converter relative noise floor. Figure 2. 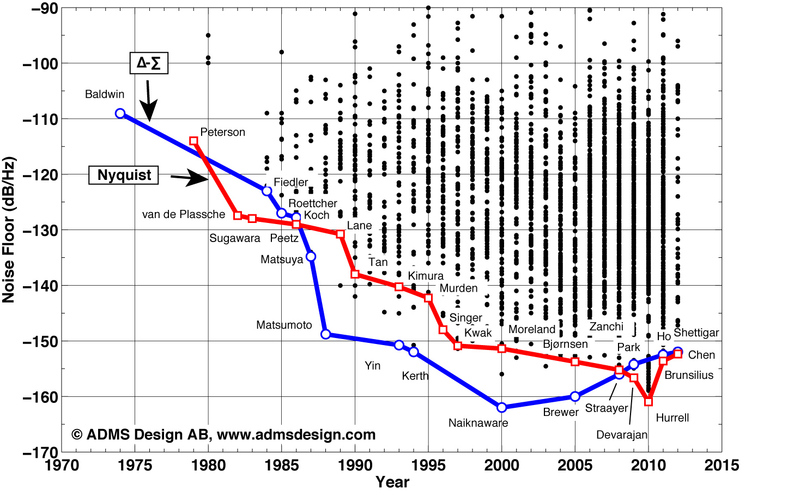 Evolution of worst-case jitter estimate for Nyquist ADCs in scientific publications. The state-of-the-art envelope has been highlighted. Figure 3. 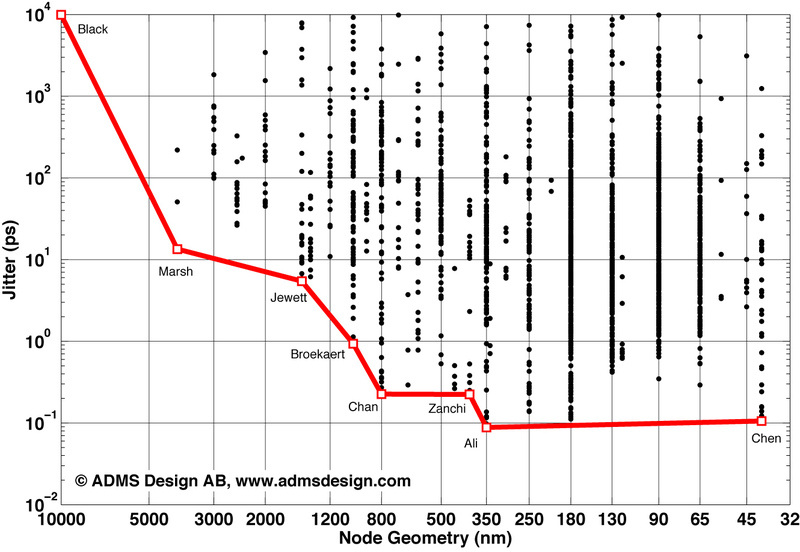 Evolution of worst-case jitter estimate for scientific Nyquist ADCs over node geometry (any technology). The state-of-the-art envelope has been highlighted. Note that jitter was analyzed by observing Nyquist ADCs. Bandpass delta-sigma modulators can achieve much better combinations of SNR and input frequency. The current state-of-the-art is a continuous-time bandpass delta-sigma modulator by Luh . A significant part of the sampling jitter in a delta-sigma modulator is suppressed either by the noise transfer function or when selecting a band-of-interest in the subsequent signal processing. An arbitrarily small jitter estimate could be achieved simply by choosing to measure the SNR over a lower bandwidth. Delta-sigma, and other narrowband ADCs were therefore excluded from the jitter observation, but are included in both the previous and the upcoming noise-evolution posts. Designs that could influence the state-of-the-art envelope, but possibly suffered from numerical problems in the SNRC estimation (for reasons described in part 1), were handled as follows: (a) All data points for which N–ENOB < 0.05 were filtered out before generating Fig. 1, and (b) The design by van Valburg  was left outside the main estimation of state-of-the-art envelope in Fig. 2. No special handling was necessary for Fig. 3. ADCs using some form of optical or optoelectronic solution may be able to sample with considerably lower timing uncertainty. As of yet, such ADCs are quite rare, and mostly implemented in unusual or purely experimental technology. Optoelectronic or all-optical solutions may very well be the way forward if classic electronic sampling saturates at unacceptable jitter levels. The survey here, however, did not cover optically sampled A/D-converters. V. E. Garuts, E. O. Traa, Y.-C. S. Yu, and T. Yamaguchi, “A dual 4-bit, 1.5 Gs/s analog to digital converter,” IEEE Bipolar Circuits and Technology Meeting, pp. 141–145, Sept., 1988. L. Singer, S. Ho, M. Timko, and D. Kelly, “A 12b 65MSample/s CMOS ADC with 82dB SFDR at 120MHz,” Proc. of IEEE Solid-State Circ. Conf. (ISSCC), San Francisco, California, pp. 38–39, Feb., 2000. A. M. A. Ali, C. Dillon, R. Sneed, A. Morgan, J. Kornblum, L. Wu, and S. Bardsley, “A 14-bit 125 MS/s IF/RF sampling pipelined A/D converter,” Proc. of IEEE Custom Integrated Circ. Conf. (CICC), San Jose, USA, pp. 391–394, Sept., 2005. C.-Y. Chen, J. Wu, J.-J. Hung, T. Li, W. Liu, and W.-T. Shih, “A 12-Bit 3 GS/s Pipeline ADC With 0.4 mm2 and 500 mW in 40 nm Digital CMOS,” IEEE J. Solid-State Circuits, Vol. 47, pp. 1013–1021, Apr., 2012. L. Luh, J. F. Jensen, C.-M. Lin, C.-T. Tsen, D. Le, A. E. Cosand, S. Thomas, and C. Fields, “A 4GHz 4th-order passive LC bandpass delta-sigma modulator with IF at 1.4GHz,” Symp. VLSI Circ. Digest of Technical Papers, Honolulu, USA, pp. 168–169, June, 2006, IEEE.